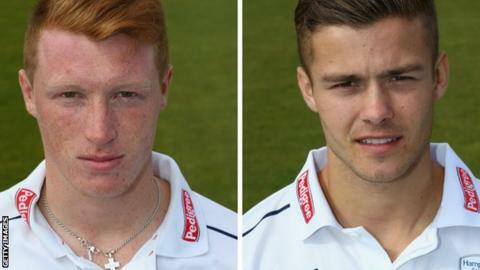 Hampshire youngsters Tom Alsop and Lewis McManus have signed new contracts to keep them at the county until the end of the 2017 season. Both players were on deals set to expire at the end of next season. Alsop, 19, struck a half-century for England Under-19s in the Test against Australia last month. Wicketkeeper batsman McManus, 20, made his second first-class appearance in the County Championship draw against Durham at the Ageas Bowl in July. "Both have come through the ranks and developed into very promising young cricketers," said Hampshire director of cricket Giles White. "Their ambition will be to push for a permanent place in the first team and we are looking forward to seeing how they progress over the next two years."